What started this whole thing was I wanted to start revamping my kitchen and the cabinets were the first item on my list. I was already set on sanding them all down and going with a dark brown, then I saw THIS photo…and my world was changed forever….I mean really, I LOVE this. From this point on, I am going to refer to this photo as the dream cabinets. I love the gray with a hint of blue. I love the flat color. I love the heavy brush strokes. I love it all and I had to have it. Let me show you some before and afters of my kitchen, then I’ll get into all my trials and errors of getting it done. Since finishing my pantry, I was able to tear down the four cabinets that I had been using to store all my food in, which not only opened up the space, but also gave me four cabinets as dummies to test my colors on. Man, I wish I were better at taking photos….I really just can’t capture how fabulous these cabinets look in person. The pictures make them look all gray, but everybody who has seen them so far has commented on the light touch of blue. Alright, down to the process…. First thing I did was set out to try and find a color like the dream cabinets. Lighting has such a big influence on how colors turn out that I actually went through 9 different samples before finding one I liked. Most colors turned out too gray or two blue once I put them on a test cabinet, and I was being stubborn about finding a perfect mix. Another issue I had was the finish of regular paint, even though I bought them in matte…it just wasn’t flat enough! I never would have thought anything of it if I didn’t see the dream cabinets…but since I did, I was set on having that flat brush finish. Chalk paint was invented by a women named Annie Sloan about 20 years ago. In most applications, instead of using a polyurethane to seal it, you seal it with a clear wax which hardens the paint once it cures. Without the wax, the finish is very flat and chalky looking that is smooth to the touch. However, without the wax acting as a sealer the paint is so soft that it scuffs by just rapping your knuckles across the surface. Sounds like pretty awesome stuff right? I agree. The downside is the cost….one quart is $37, and the clear wax is $25, oh then there is also the special wax brush recommended for applying the wax in an even fashion….that brush is $29. So right off the bat you are looking at a pricy project, and that’s if you don’t change your mind about what color you want to use. Buuuut, while I was still knee deep in research I also stumbled upon a few different DIY chalk paint recipes. 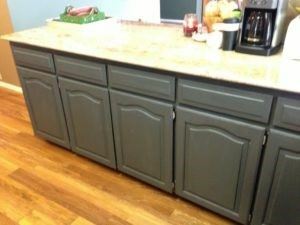 Now I’m not opposed to saving money if a product can be DIY’ed, but the last thing I wanted was some knockoff recipe that would be forcing me to refinish my cabinets in a few years time. If that was going to be the case then I would just pay the money for the real stuff and never look back. However, after reading review after review on them I decided that it looked like a safe bet, so I moved forward…. The recipe for making your own chalk paint is a 1:3 ratio of Plaster of Paris to any latex paint you want to buy. What I did was grab a plastic tupperware container from my kitchen since it already had measurements marked along the side, and took a sharpie to the first four lines so they would stand out when I was mixing. Any clear container would work, just grab it and draw four equal lines on it. I actually do not recommend using the same container I have here because of the corners it has. When trying to mix the plaster, it is difficult to get it all when it has so many small crevices to hide in. So if you can, grab something with a round bottom that will eliminate this. 1) Pour in Plaster of Paris up to the first line. Then grab a tablespoon and mix in about 2-3 tablespoons of water. Keep mixing until the graininess is gone and your plaster looks like sour cream. 2) Add paint till the mixture reaches the fourth mark, then mix again. With using a clear container it’s easy to look at the bottom to see if any is missed. Important: Be sure to mix the water with the plaster before adding the paint or you will never get all the lumps to smooth out. The color I ended up loving was called Evening Hush by Behr. So I spent $11 for a quart and $8 for the plaster, then went home and mixed up my first batch of chalk paint. 1) Now it says everywhere that chalk paint doesn’t require any sanding, stripping, or priming. …I find that crazy, but I’m not going to complain because I have 23 cabinets, and 12 drawers to refinish. So the first thing I did was get a drill and start taking down the doors and moved them out to the shop. 2) Even though no sanding was needed, I still wanted to give the doors a good cleaning so I bought an $8 container of disinfectant wipes and damn near used the entire thing before my cabinets were clean. I would guess that these cabinets are the original ones from when the house was built…I would also guess from the amount of dirt I got off them, non of the previous owners ever gave them a scrubbing. 3) After wipping down the doors, I then came inside and wiped down the boxes and drawers. Note: Currently I have light brown (ugly) contact paper lining the bottom of my cabinets, while the walls are a dark brown. I have not decided if I want to go gray with the inside or if I want to do an accent color. So for the time being, I left the contact paper and colors alone. This being said I did not remove anything from my cabinets. Since I was not doing any sanding, there was no point! I just moved everything back a little bit so that when I came through with a brush, nothing would get painted. So I literally took the doors off, moved thing back slightly, then went about the process. it would take me 9 days to finish my kitchen, but all that while I was still able to make meals and use the kitchen as I normally would. The only items I moved were the contents of the drawers so that I could paint the inside. It was time to start painting, and reading online it looks like if I wanted to achieve that heavy brush stroke look like the dream cabinets that I needed to buy a chip brush. Lucky for me Home Depot sells them for $2. I started with the doors first, then moved inside to do the boxes. Tip: When you are painting using chalk paint, don’t make a bunch of short back and forth strokes like you normally do using latex paint, instead make real long strokes. When I was painting a door, I would get paint on my brush, then start in the middle of the door and go all the way to the top then back down to the very bottom then repeat until it was covered, then just move to the side slightly and do it again until the door was coated. Start off with just some paint on your brush and get a feel for how much paint is needed. Chalk paint goes a lot further than regular latex paint. 4) When painting the doors, I started off painting the face then let them dry, then came back and painted the back. Since I was working on these in the evenings after work, I did one side one night then the back the next. if you are trying to do it in one day, leave about an hour dry time before flipping them over. WilkerDon’t: With this being my first time using chalk paint, I wasn’t yet familiar with how soft the paint was before being sealed, so when I flipped my doors over I wasn’t overly careful and ended up scuffing up most of the faces in a handful of places. To prevent this, either paint then seal that side before moving to the other, or grab a shop towel or old T-shirt to lay down as protection to the paint. I prefer the latter option since I like to do one step at a time but either way will work. This chalk paint is wonderful! I was able to do my entire kitchen…the cabinet boxes and doors with just a quart of paint (about 4 batches of chalk paint). I only did one coat of paint on the majority of it with just a few areas that needed a thin second coat. The next step in the process using chalk paint is to seal it with clear wax. Since I didn’t buy real AS chalk paint, I went online to see what wax was comparable to AS wax and found Minwix Paste Finishing Wax recommended, so I went up to Home Depot and purchased some for $9. Then also wanting to have an even finish I purchased a Wooster wax brush (although they call it a stencil brush) for $12. 6) After watching tons of videos and reading FAQs concerning the application of clear wax, I started to apply the clear wax to a couple of the door faces. This is where I started having the problems…. I was worried after the first one because it looked like crap and I hated the look it gave the paint, but I moved forward doing about five of them before calling it quits. Each one I tried something different. Using less wax, rubbing off less, rubbing off more, putting it on in a different pattern….no matter what I did, I did not like the outcome. So I started researching different alternatives to using the wax. One thing was clear, leaving the chalk paint without any type of sealant was not an option. The paint just scuffs and scratches way too easy. Reading FAQs about chalk paint, it says that if you are using it for an outdoor use, then instead of using wax to seal the paint, you need to use polyurethane. Bloggers say to use polycrylic (which is water based) so that it does not yellow over time. Well I figured since it was compatible with the paint, that I could use it regardless of the indoor/outdoor position. So I sanded down the five that had wax applied, then repainted them, then applied the poly……and I hated it. The door on the left has the poly and the one on the right is just paint. In the picture there is only a slight difference, but looking at it in person it is drastic. Ok, so maybe not drastic drastic…but it was drastic enough to make me hate the color. So I sanded the few I did with poly and re-painted them again then went to research what my other options where. I surfaced with two more options 1) using Mod Podge in a matte finish 2) using deck sealer. 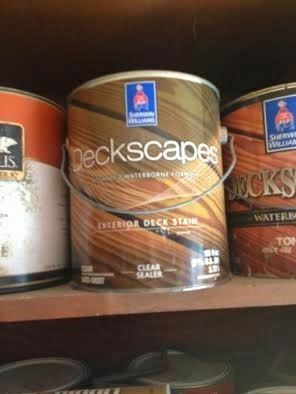 A Sherwin Williams suggested the Mod Podge and my husband suggested the deck sealer. Well I had some deck sealer already in the shop so that was where I headed and sure enough, it kept the color way better than the poly and was a heck of a lot easier to use than the wax. 7) I grabbed a couple foam brushes I typically use for staining and went to town sealing. It comes out looking milky but dries clear. I used a smaller size brush to make sure there wasn’t any build up in the corners. I put on 3 coats total. In this last photo, the door is still rather shiny, but it dies down after it dries completely. I’m not sure why deck sealer would work better than the polycrylic because it too is water based, but I wasn’t going to fight it. It worked and it was so easy. I actually called Sherwin Williams the following morning to ask about any repercussions they could foresee with me using an exterior deck sealant on kitchen cabinets. The only halfway concern was that deck sealer was meant to go on a stained finish and not paint, so the rep was worried that it was drying on the surface and would flake off in years to come. I pointed out that chalk paint is super porous and thats why it is suppose to be sealed with wax. After hearing that, the rep said he didn’t think I would have any problems. Edit: I have received several emails asking for more details on the type of deck sealer I used. So I thought I would post a photo of the can. Like I said, I already had this laying around so I didn’t pick this one over any others for a particular reason. I had a reader tell me she tried Thompsons because it is so much cheaper, but she didn’t like the results so she went ahead and bought the SW and ended up loving it. So again…I’m not sure why there is a difference, but you get different results from the different brands. Hope that helps. 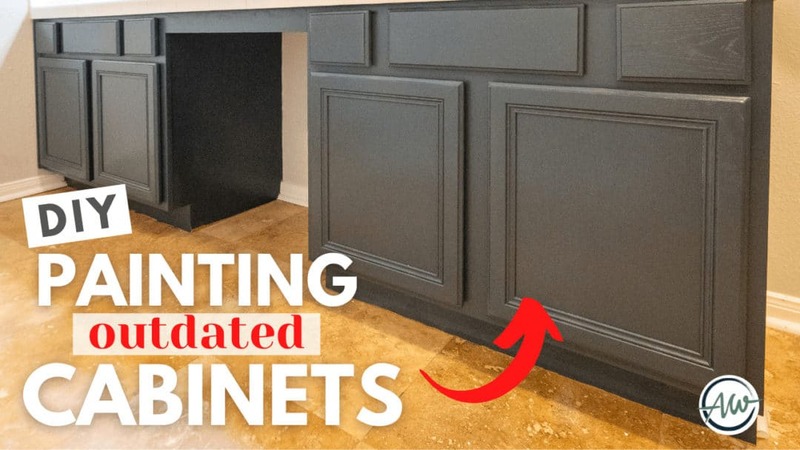 So wether you use wax or poly or another type of sealer, I completely and totally recommend using chalk paint to refinish your kitchen cabinets. The painting was the simplest part in this whole project and it was super cheap with me using the DIY recipe.